Wasn't yesterday exciting? I thought I'd do some organizing while watching the election results, but got caught up in the moment instead. Sometimes organizing has to take a back seat to history. Still, it isn't an excuse to slack forever. So I'm back on the wagon, with an ever growing list of organizing projects to tackle. You'd think that the more organized I got, the less I'd have to organize, but oftentimes it feels as if the opposite has happened: the more organized I get, the more there is to organize. Go figure. This is the way I determine what organizing project to work on: I notice what's getting on my nerves the most. Lately, it's been my purse and work bag. Or I should say: my purses and work bags. Because when my purse or work bag is on the verge of getting so completely overstuffed to the point of bursting, my Super Special Trick is get another one. Not a bigger one, necessarily, and not a substitute for the original, but more like an addendum, an additional piece to carry around, in addition to the first. So last week I was carrying around four pieces, a purse, a largish makeup bag, a briefcase, and an enormous tote, which would be quite reasonable if I was going to Europe for three weeks. In fact, more than one person in my building has recently wished me bon voyage in the morning while riding down the elevator, which is gets to be embarrassing when the same person sees you riding back up that afternoon, with purse, makeup bag, briefcase and tote in hand, and maybe a plastic grocery bag to catch the overflow. So this afternoon I settled down and emptied out my purse(s) and work bag(s) onto the floor, and steadily made my way through them. The purses took a little more than a half hour; the work bags more like an hour and a half. 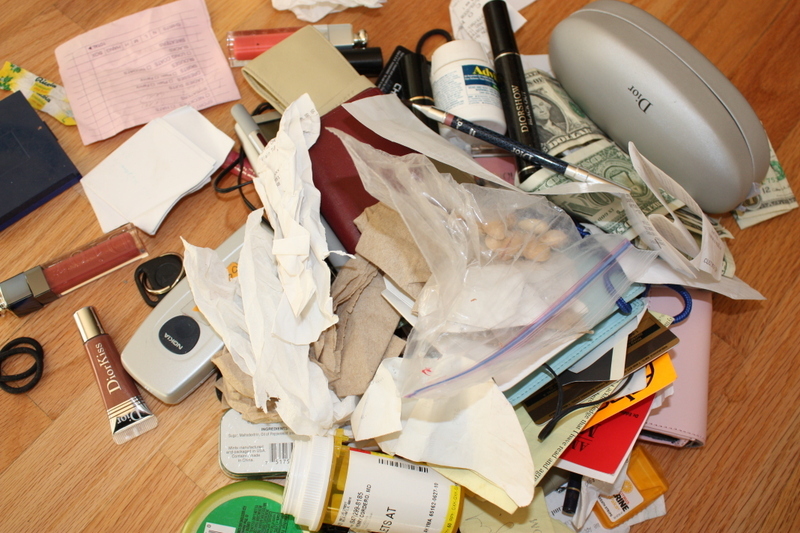 Between all four, I ended up throwing out over 100 items, including paycheck stubs, post-its, photocopies, receipts, cough drop wrappers, dry cleaning tickets, crumbly aspirin pieces, mint tins, gummy ponytail holders, pen caps, business cards, notes, a pair of crushed sunglasses and some broken earphones. I'm hoping I will see some of the well-wishers in the elevator tomorrow morning, but then again, maybe they won't recognize me without my quadruple-load of stuff. 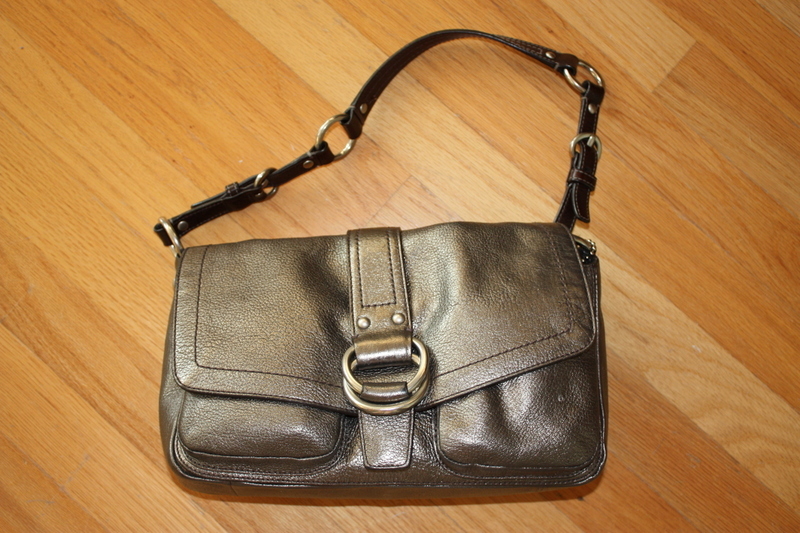 Above, left: my poor little purse; it's actually a very small bag. Above, right: but I really need to carry six lip glosses, two lipsticks and three lip liners with me at all times. 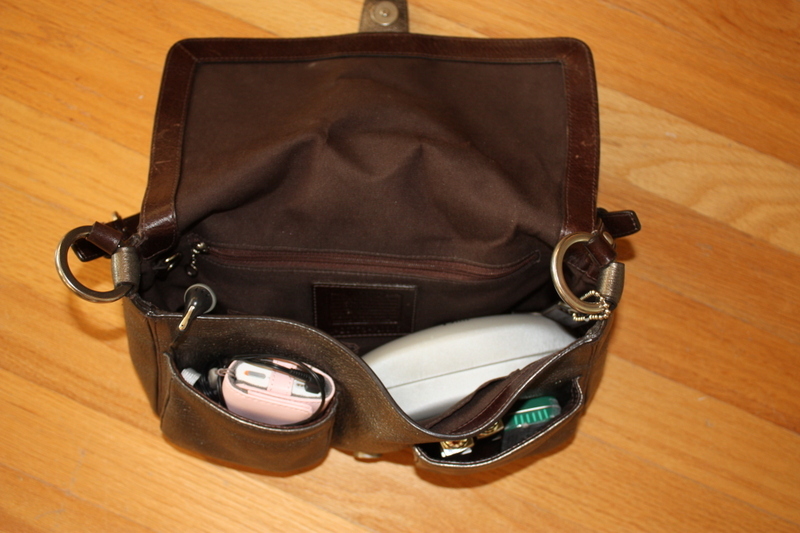 Above, left: the contents limited to a pen, a few tissues, wallet, cell phone with hands-free earpiece, ipod, sunglasses/sunglass case, ibuprofen, mints, two lip glosses and a single lip liner. Above, right: it actually snaps shut!